Dear Daddy – No letters today but five yesterday up to Dec. 23. Also a letter from Geo. Wingfield Jr. He is in San Diego now. He didn’t give any address except N.A.S. It is cloudy today and below freezing a few degrees. Washburns’ are celebrating their Golden Wedding at Howard’s today. I want to call on them sometime during the day. David is taking his nap. He wants to climb the stairs now that he has discovered that he can. I will have to get a gate or some kind of barrier across the bottom so he won’t have to be watched. Mrs. Zell and I are planning to take some of their fresh pork over to the locker. I don’t have so much in the drawer now. I ordered half a hog but Brands are short of help and haven’t got it put in yet. Tomorrow is Jimmy Ed’s birthday. I have a gift and card for him. I don’t believe Lucile is going to have a party for him because of the flu and colds around now. James L. II has a birthday the 11th. I am sending him a card today but haven’t a gift for him yet. Can’t get what I want here and haven’t been to Laf. recently. Can’t always get things there either. I may go down Sat. so I can take Mark for an X-Ray. I wish I could take him to a warmer climate – I believe he needs more sunshine. 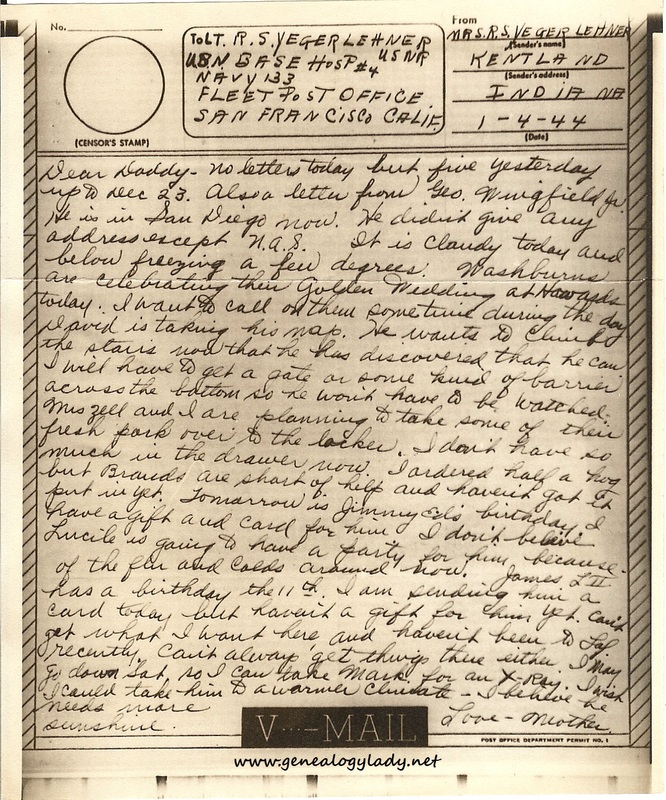 This entry was posted in Foster, Genealogy, World War II, World War II Letters, Yegerlehner and tagged Brands, David A. Yegerlehner, genealogy, George Wingfield Jr., Gladys R. (Foster) Yegerlehner, Indiana, James L. Foster, Jimmy Ed Johnson, Kentland, Lucile Johnson, Mark A. Yegerlehner, Norma Zell, Roscoe S. Yegerlehner, Washburn, World War II, World War II letters on September 18, 2015 by Deborah Sweeney.